On Wednesday, the star of PBS' Sesame Street got a social-media boost no one expected after Mitt Romney dismissed the channel and Big Bird as frivolous. "I'm not going to keep on spending money on things to borrow money from China to pay for it," Romney said during Wednesday's debate with President Obama. 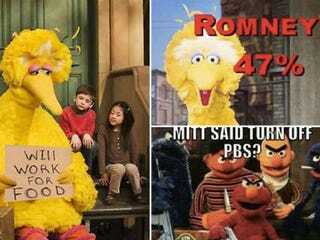 New York Times columnist Charles M. Blow won't stand for Romney's attack on Big Bird, like many others on social media, where a meme swirled around featuring the yellow-feathered children's hero holding a sign that he'd been put out of work, thanks to Romney. I know that you told Fox News this week that you were "completely wrong" for making that now infamous 47 percent comment, but probably only after you realized that it was a drag on your poll numbers. Your initial response was to defend it as "inelegantly stated" but essentially correct. That's not good, sir. Character matters. Big Bird wouldn't have played it that way. Do you really believe that Pennsylvania Avenue is that far away from Sesame Street? It shouldn't be. Let me make it simple for you, Mr. Romney. I'm down with Big Bird. You pick on him, you answer to me. And, for me, it's bigger than Big Bird. It's almost impossible to overstate how instrumental PBS has been in my development and instruction. We were poor. My mother couldn't afford day care, and I didn't go to preschool. My great-uncle took care of me all day. I could watch one hour of television: PBS. When I was preparing for college and took the ACT, there were harder reading passages toward the back of the test. Many had scientific themes — themes we hadn't covered at my tiny high school in my rural town. But I could follow the passages' meanings because I had watched innumerable nature shows on PBS.